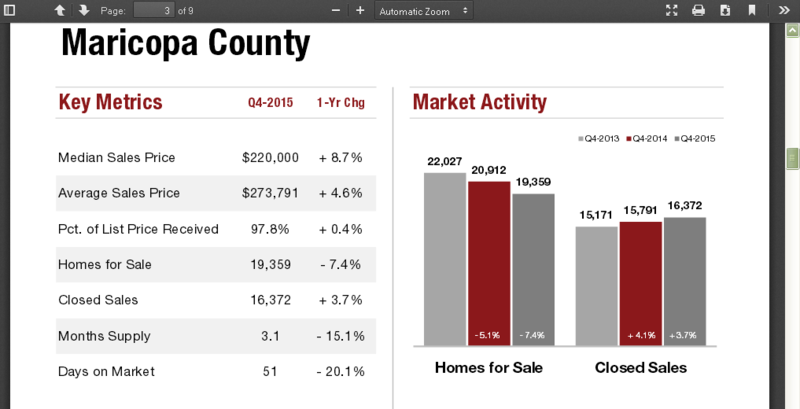 In the Maricopa county real estate market in the 4th quarter of 2015 we had a median sales price of $220,000. There was a 8.7% increase from a year ago. Our average home sales price went up 4.6% which shows we are back to a steady growth market and things are becoming more and more stable in the Phoenix Arizona. The days on market have dropped 20% to just 51 days on average. Last the number of homes sold is up 3.7% from a year ago. Buyers are ramping up, possibly due to the millennial impact on the market that some predicted would occur in 2015. It looks like my generation has been a little slow getting into the work force and out of mom and dad's basement, but we are making our mark on the world at our own pace. 2016 appears to be set for a regular paced market with continued growth in home sale values.